Most of the conspicuous fungi found locally are over for the year by December, but we have had several interesting ones recently. On 6th December, Gwen Richards and I were returning from a Non Estuarine Waterbird Survey bird count along the west coast of Loch Nedd. Our route took us through the Duart woodlands (NC1332), which are notable for their huge prostrate grey willows Salix cinerea, festooned with tree lungwort Lobaria pulmonaria. A fallen birch twig caught our attention, bearing a glove-like fungal growth about 5cm across and somewhere between buff and orange in colour. Although it rang a distant bell, there seemed to be nothing similar in Phillips’ very useful photographic guide. However, Bruce Ing named it for us a few days later. It is an odd distorted form of the Pipe Club Macrotyphula fistulosa var. contorta. My vague memory was correct; John Blunt recorded it as having been found by me at Nedd on 13th December 2009! 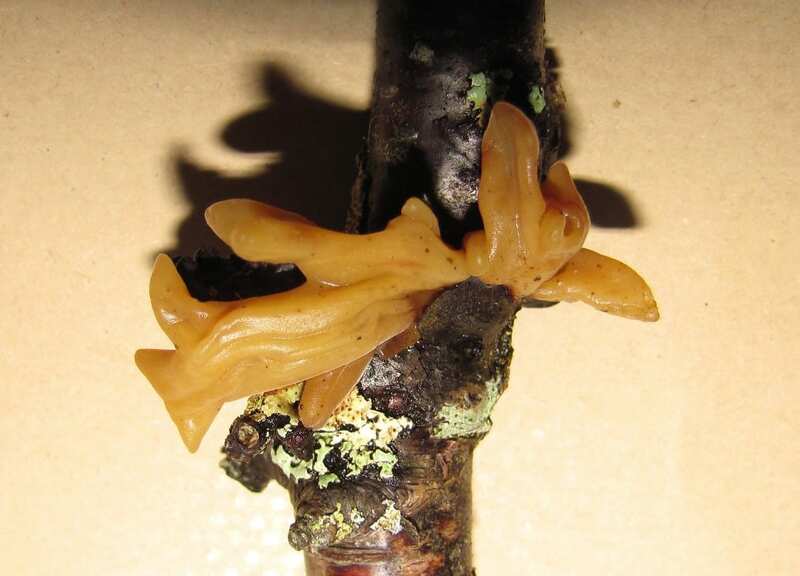 The more typical form, with upright fruiting bodies, has been found at Nedd, and also by Gwen in a number of places including Culag Wood and Torbreck (see Gallery-Fungi). The following day, we set out along the cliffs from Duart Loch for the next NEWS sector to the north. 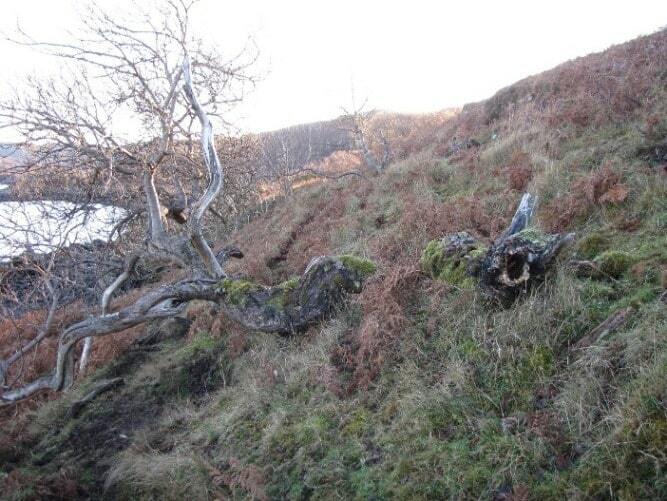 A solitary large grey willow on the cliff-top had fallen over and re-rooted about half way along its trunk. 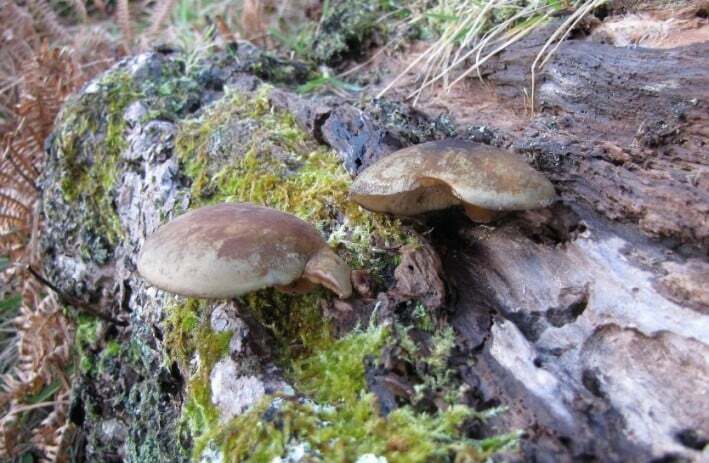 The older, rotting part of the trunk was covered with olive gill fungi with lateral stalks, varying in size from buttons to full grown brackets about 6cm across. A specimen that was collected did match up quite reasonably with an illustration in Phillips, that of the Olive Oysterling Panellus serotinus and Bruce was later able to confirm this. John Blunt has three earlier records, from the Inver Woods (26.11.02), near Rhicarn (6.12.04) and near Glencanisp Lodge (20.1.06), the first two on birch, the last unspecified. As you can see, all the records are in the winter months. Lastly, and again a by-product of a NEWS count, on 11th December Gwen, Clarinda Chant and I found some colourful yellow and green parrot waxcaps Hygrocybe psittacina on the lawns of the holiday chalets at Strathan (NC0821). Who says counting birds can’t be interesting?